I know I'm a little late to the kale chips bandwagon, but let me assure you, it's with earnest appreciation, not hipster abandon. I've eaten kale for years, usually sauteed in grass-fed butter and paired with over-easy pastured eggs for a savory breakfast or wilted into a spicy & brothy pork soup. Over time I began throwing it into afternoon green smoothies. 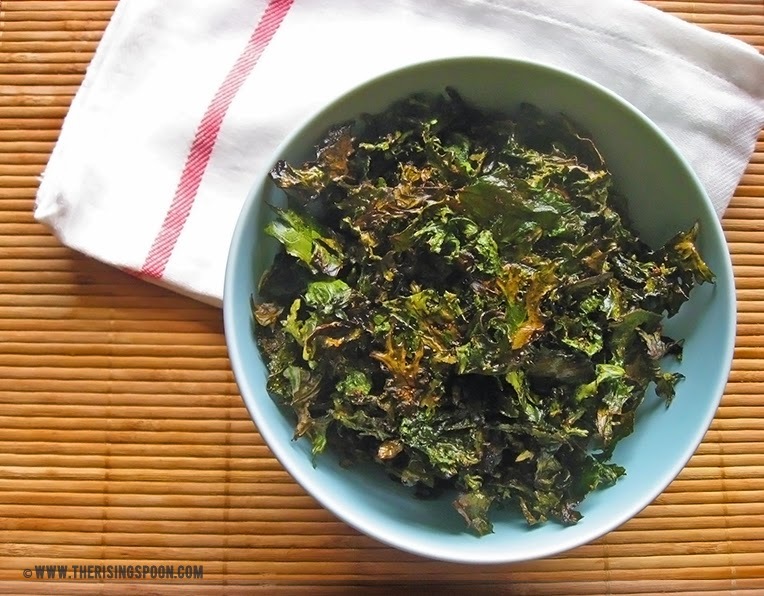 However, it wasn't until I read the book Real Food Survival Guide For Busy Moms that I was inspired enough to get creative with my kale and turn it into a crispy snack. I made the author's kale recipe (with really interesting spices) last August and was thoroughly impressed. But then laziness struck and I avoided making any more kale chips. I don't know why. It's not hard. 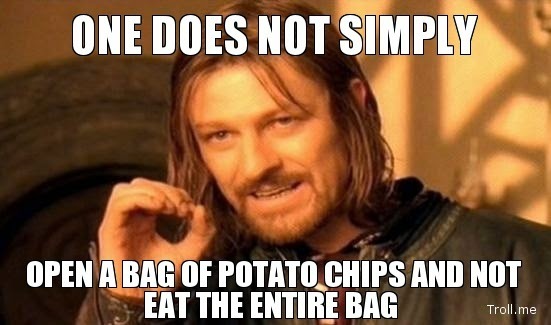 Now that I think about it, perhaps my sudden addiction to potato chips interfered. It manifested like a that time of the month craving, but instead of leaving after a few days, stuck with me into the late fall and winter. It was odd, but who am I to question cravings? Maybe it had some deeper metabolic meaning, but I figured it was just my body (or brain's) way of saying "we need something particular in this here food for a bit." (I pronounced that in my head as country accent, by the way). I relented multiple times a week, with these chips and these chips cooked in avocado oil, these chips cooked in coconut oil and let's be honest, these chips, too. Please tell me you can relate, right? Well, it's spring now and the potato chip addiction has passed. For the most part. I now have my sights set on asparagus recipes and I'm starting to crave salads again. The Chips are Back. 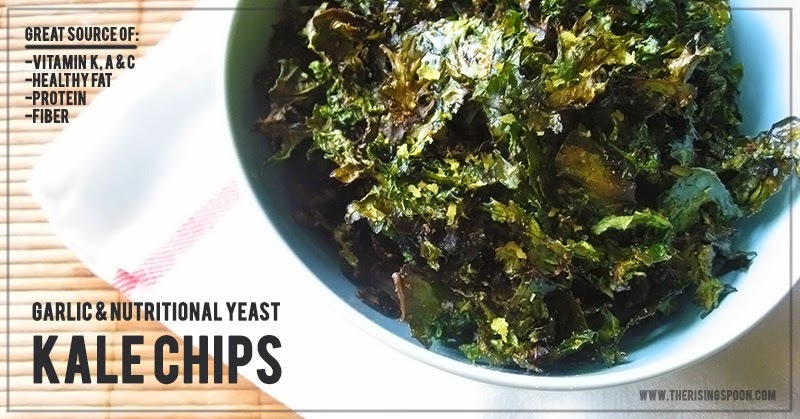 Kale Chips, that is. Last weekend I nabbed a bag overflowing with tender Russian kale at my local farmers' market. When I told the fellow running the stand that his crop would make great kale chips, he immediately perked up, agreed, and offered to sell me a 20 pound bag of kale so I could make a bunch all at once. I wasn't quite ready for that, so I laughed and politely declined. All in good time, sir. For now I'm content with making small batches of kale chips with whatever I happen to pick up at the health food store or local farmers' market. 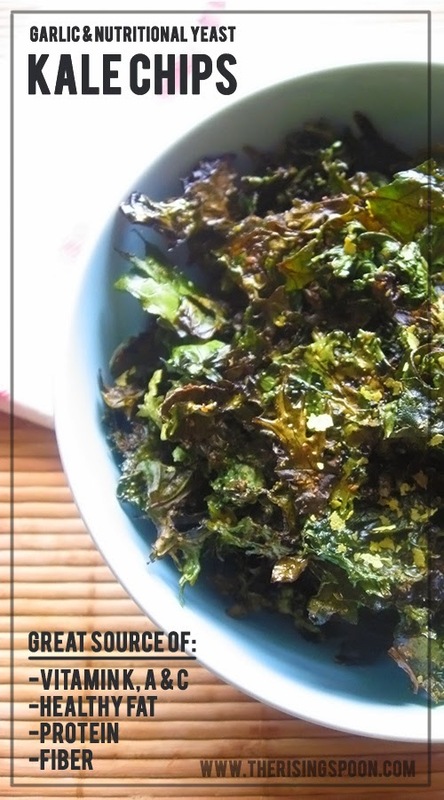 They make an excellent snack and are an easy way to sneak extra greens into your diet. Even my picky, meat-and-potatoes-lovin' boyfriend enjoys them. And you know what's even better? They're ridiculously healthy! Check out this post to learn more about why kale is awesome. *I recommend using kale that's organic or locally grown with organic practices. This is because fresh greens are high on the Dirty Dozen list and conventional versions have higher traces of pesticides on them. Pre-heat the oven to 350 degrees. While that's heating, measure out the coconut oil into an oven safe container (I used a small glass dish), set a timer and stick it in the oven for 2 minutes. This will melt the coconut oil. Alternately, you can melt it in a saucepan on the stove top. Wash and dry the kale. Make sure it is as dry as possible, otherwise it will take longer to crisp up in the oven. Tear off the leaves into whatever size you want, removing and discarding any tough or woody stems. Spread the kale leaves across the baking sheet, pour the coconut oil on and mix with your hands so they're evenly coated. Season to taste with good quality granulated garlic (or garlic powder), nutritional yeast and sea salt. I like to add extra nutritional yeast so it has a stronger "cheesy" flavor. You can always add more seasonings after they're crisp. Bake for 15 minutes, stirring halfway through, or until the kale leaves are all crispy. 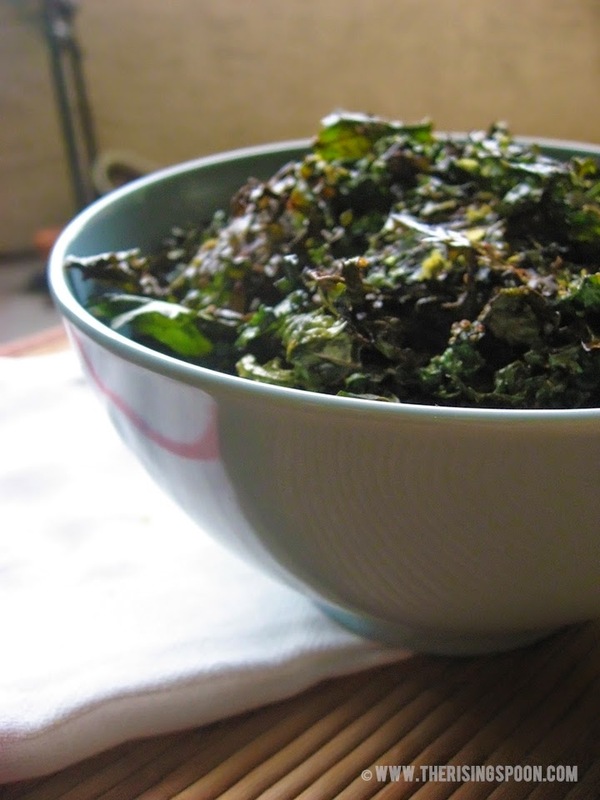 If your kale was particularly wet before adding the coconut oil it could take 20+ minutes to crisp, but keep an eye on them. 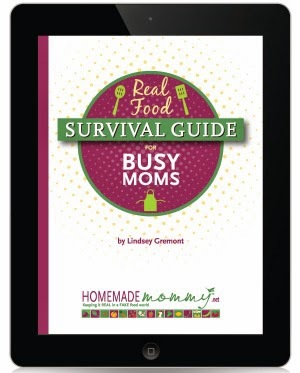 I adapted it from Real Food Survival Guide For Busy Moms by Lindsey Gremont of the real food blog, Homemade Mommy. Click here to read my review of Real Food Survival Guide For Busy Moms and snag a copy for yourself! Question for Discussion: What's your most creative recipe for veggies? Want to see my favorite real food products & gadgets? Check out my shop page.